I have been purposefully absent from this blog for a while. I hit a rough patch at work and in my personal life and I simply had no desire to narrate any of it. Today was a day of dramatic ups and downs, and I decided that now would be a good time for an update. While my job has a variety of positive and enjoyable aspects, it's nowhere near perfect. Issues start to arise, many of which are out of my control, that affect my performance. Customers become overwhelming and the reality of my inability to fix every single problem becomes overly apparent. I'm expected to meet certain criteria monthly, and if not, then management starts to hover and nitpick, turning my fairly independent job into one of constant supervision and scrutiny. I can handle a lot of the stress that comes with my job - the uncertainty of customers, the inevitable shortcomings, the almost unrealistic expectations of upper management - but when I lose my freedom to do my job and be responsible for my own work, my job becomes suffocating and overwhelming to a point where I simply don't handle it well. While getting dangerously close to my breaking point at work, I was jolted back to a positive place when I got a call for an interview - a management position I had applied for. It is within the same company but at a different location. I was not familiar with any of the other managers over there, but I figured that would be a good thing, a fresh start and a new environment. I went to the interview and it lasted for over an hour. Things seemed to be going swimmingly. I called to follow up the next week and I was informed that the decision had not yet been made, but I was one of the final two. It was between me and another guy. I responded to a few follow up questions and then a week later, I got a phone call. I was full of excitement when I answered the phone, recognizing the number. But I could tell almost immediately that the news I was getting was not what I hoped for. He started off the call by saying, "I don't normally do this, but..." and I knew I hadn't gotten the job. He had called to tell me they went with the other person. I thanked him for the opportunity, and inquired about what I could have done different. I think he was surprised at the question because he didn't really give me a straight answer with any useful criticism. I managed to control my emotions until I pushed "end call" on my phone, and then I broke down. question myself and my abilities. What I am missing? Do I just not have the management gene? Part of me wants to just give up trying to get into management. I've tried so many times and never succeeded, there must be a reason they don't choose me. Maybe I should just stick with my blue collar job and be content with the fact that it pays decent. But I'm not content with that, and I know I'll keep trying, for as long as it takes, to move up into management. No matter how many times I get turned down, I'll still keep striving for it. I've also broadened my search for management positions with other similar companies so as not to limit myself and my opportunities. I want to have a career, not just a job. So I've also started really diving deep into my own thoughts and desires to try and determine what it is that I TRULY want to do with my life. What would make me happy? What is my passion in life? What sort of job could incorporate my work experience and skills with the things I truly enjoy and am passionate about? It's the ultimate question for me right now. But in the meantime, I still have to resume my regular work. Returning to my already exceedingly stressful job after the defeat of not landing the management position has been simply brutal. But slowly I am recovering and getting back into the groove of things at work. I'm good at what I do and I take pride in my work. That's really all I can do for now. That, and as Dory would say, "Just keep swimming." This photograph is of a wonderful lady I met while at work a few years ago. My job consisted of going in and out of yards and sometimes houses which normally was pretty awesome because of the ever changing environment. But in this particular area, there was a lot of resistance which made my job highly stressful. I love chatting with customers, seeing new things, hearing new stories - it's one of the reasons I enjoy working "field" jobs to this day. But in this city it had gotten to the point where I would hope people didn’t answer their doors so that I wouldn’t have to interact with anyone - which is totally opposite of my normal behavior. Afterwards I went inside and she motioned for me to follow her, and she showed me these piles, baskets, and trunks full of crafts she had made. They were gorgeous! She told me to pick out a set of potholders from the trunk. I asked her if she had ever thought of selling these beautiful items, and she said she used to have four shops downtown, but with the economy, she had to close them up, one by one, and now she doesn’t sell anything at all. I asked her why she still kept making them, and she told me, “It’s my therapy.” I was enthralled by everything she was talking about. She was wise without being condescending, yet with a gentle sternness to ensure that I was taking what she said to heart. I regretted having to leave, I wished I could’ve stayed there all day. But I had to get back to work. I told her how much I appreciated her time and the gift, and then asked for one small favor before I left - if I could take a picture of her. I told her I admired her sewing machine from the minute she had opened the door, and would like a picture of her working at it, just like my first impression of her. She blushed and commented about how she wasn’t even wearing a nice shirt, but said she would love to. She told me a little more about the sewing machine as well. 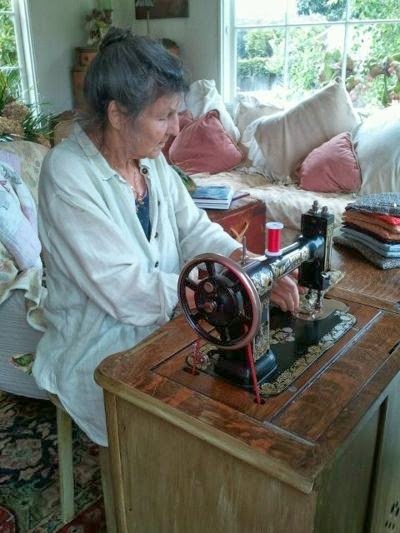 It was her mother’s, made in 1909, and she still does all her sewing on that, and only that machine. I told her it was beautiful, and so was she. I took this one photo of her working at her machine. Just this one. It was perfect, I had no need to retake it. I thanked her again and then reluctantly left to continue on with my work day. I love this picture so much because it reminds me not just of this woman and her stories, but it is a constant reminder that I never know what will come next. It doesn’t matter how bad of a day I’m having, or how many “difficult” customers I’ve had to deal with, there’s always another door, and I never know who will be behind it. This still rings true with my current job as well. When I have customers treat me poorly, I think about Gloria and she is a reminder that I can’t let negative experiences make me a negative person. Every second - every breath - is brand new. And I need to make the best of it and be the best person I can be.